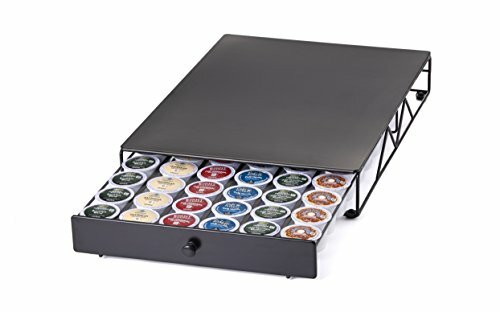 The Nifty 54 Coffee Pod Single Drawer is a stylish, space saving way to store your favorite K-Cup portion packs. The extra large capacity, space saving design allows for you to place the brewer on top of the drawer, so your K-Cup portion packs do not take up any more of your precious counter space. The Nifty 54 Coffee Pod Single Drawer will hold 54 K-Cup portion packs. The large capacity drawer will utilize the dead counter top space behind the brewer. The larger drawer also allows you to set the brewer on the front of the drawer so the upper cabinets do not interfere with the operation of the brewer handle. The sliding drawer construction makes selecting your favorite K-Cup portion pack extremely easy. The satin black finish looks great on any kitchen countertop.